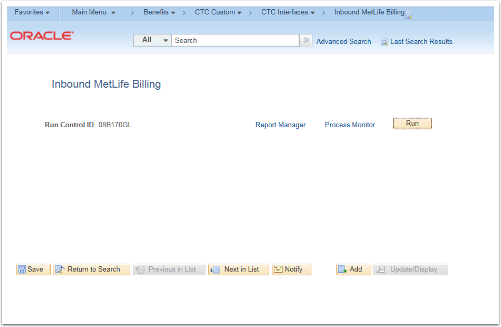 Purpose: Use this document as a reference for how to understand the MetLife interface andtransmittal's relationship to PeopleSoft at a high level in ctcLink. The file is split out by system (PeopleSoft and Legacy). The PeopleSoft file is transferred to the production environment and automatically loaded into the HCM pillar. The file is also split out by college and becomes available in SUE (Secure Upload Engine) for PeopleSoft users to download and use for validation of the automatic data load into HCM. This is a change only (add, change, remove) file sent from MetLife with deduction data. Any change to deduction data, would cause an employee to be included in the file. The file is generally produced 4 days prior to payroll, but is scheduled to run every night so a human being does not necessarily need to run this process. Generally, new data will result in new effective dated records being added to the general deduction for that employee, but it is possible that corrections will be sent requiring the update of an existing record. These would be recognized using the dates based on pay period end date. 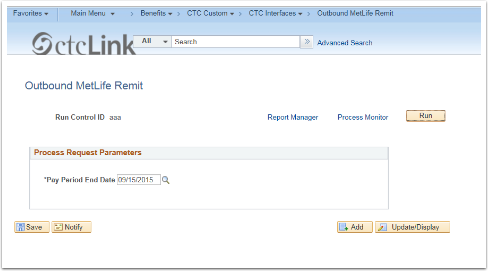 Note: PeopleSoft table PS_CTC_MET_REMIT maintains the billing file pay end dates that have been processed and will need to be updated for any reruns required. Note: The outbound process is consolidated, so all runs of a specified payroll must complete successfully at all colleges specified. If all colleges specified have not completed the specified payroll, do not send the MetLife Remit file. Outbound file covers all people who had MetLife Insurance deduction 000065 taken from their paycheck that pay period.